The idea came to Jorge Odón as he slept. Somehow, he said, his unconscious made the leap from a YouTube video he had just seen on extracting a lost cork from a wine bottle to the realization that the same parlor trick could save a baby stuck in the birth canal. Mr. Odón, 59, an Argentine car mechanic, built his first prototype in his kitchen, using a glass jar for a womb, his daughter’s doll for the trapped baby, and a fabric bag and sleeve sewn by his wife as his lifesaving device. About 10 percent of the 137 million births worldwide each year have potentially serious complications, Dr. Merialdi said. About 5.6 million babies are stillborn or die quickly, and about 260,000 women die in childbirth. Obstructed labor, which can occur when a baby’s head is too large or an exhausted mother’s contractions stop, is a major factor. The current options in those cases are forceps — large, rounded pliers — or suction cups attached to the baby’s scalp. In untrained hands, either can cause hemorrhages, crush the baby’s head or twist its spine. Although more testing is planned on the Odón Device, doctors said it appeared to be safe for midwives with minimal training to use. Along the way, it has won research grants from the United States Agency for International Development and from Grand Challenges Canada. “We’ve given out $32 million for 61 different innovations, and this one is the farthest along,” said Dr. Peter A. Singer, the chief executive of Grand Challenges Canada. The device will be manufactured by Becton, Dickinson and Company, or BD, of Franklin Lakes, N.J., which is better known for making syringes. “My first reaction, as soon as I saw it, was positive,” said Gary M. Cohen, the company’s executive vice president for global health. It was at the World Economic Forum in Davos, Switzerland, that Dr. Merialdi asked him to consider taking it on. So far, the device has been safety-tested only on 30 Argentine women, all of whom were in hospitals, had given birth before and were in normal labor. The W.H.O. will now oversee tests on 100 more women in normal labor in China, India and South Africa, and then on 170 women in obstructed labor. In a telephone interview from Argentina, Mr. Odón described the origins of his idea. He tinkers at his garage, but his previous inventions were car parts. 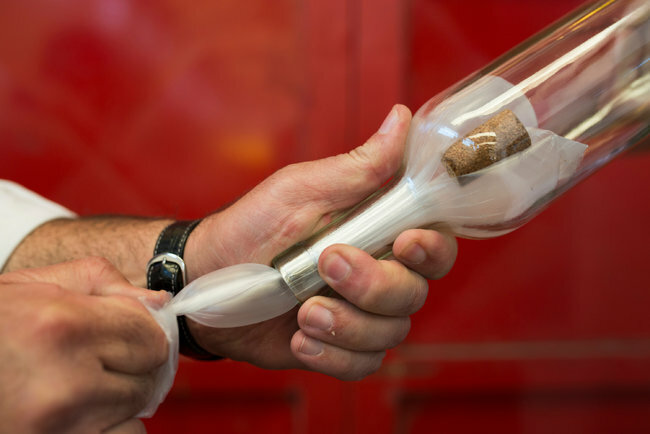 Seven years ago, he said, employees were imitating a video showing that a cork pushed into an empty bottle can be retrieved by inserting a plastic grocery bag, blowing until it surrounds the cork, and drawing it out. That night, he won a dinner bet on it. The next morning, a somewhat skeptical friend introduced him to an obstetrician. “You can imagine these two guys in suits in a waiting room full of pregnant ladies,” he said. The doctor was encouraging, so he kept working. Polyethylene replaced the bag his wife had sewn, and the jar was replaced by a plastic uterus. With the help of a cousin, Mr. Odón met the chief of obstetrics at a major hospital in Buenos Aires. The chief had a friend at the W.H.O., who knew Dr. Merialdi, who, at a 2008 medical conference in Argentina, granted Mr. Odón 10 minutes during a coffee break. The meeting instead lasted two hours. At the end, Dr. Merialdi declared the idea “fantastic” and arranged for testing at the Des Moines University simulation lab, which has mannequins more true-to-life than a doll and a jar. Since then, Mr. Odón has continued to refine the device, patenting each change so he will eventually earn royalties on it. “My daughter said, ‘And now I can have my doll back,’ ” he said. It is too early to know what BD will charge, Mr. Cohen said, but each device should cost less than $50 to make. While the company expects to profit on all sales, it will charge poor countries less. Dr. Merialdi said he endorsed a modest profit motive because he had seen other lifesaving ideas languish for lack of it. He cited magnesium sulfate injections, which can prevent fatal eclampsia, and corticosteroids, which speed lung development in premature infants.